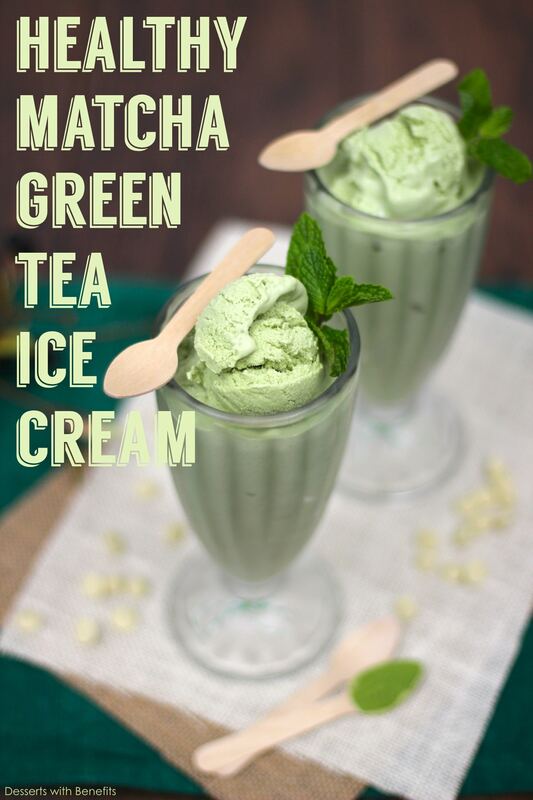 This delicious, sweet, and creamy Healthy Matcha Green Tea Ice Cream is secretly low calorie, low carb, sugar free and packed with protein! 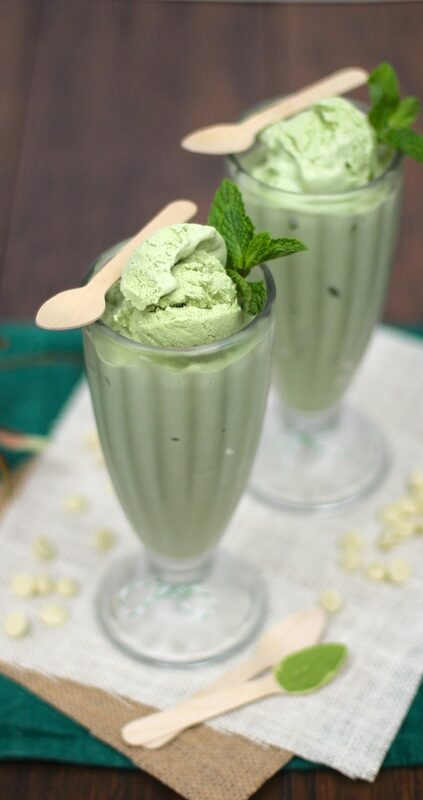 This delicious, sweet and creamy Healthy Matcha Green Tea Ice Cream is secretly low calorie, low carb, sugar free and packed with protein! In an electric stand mixer bowl fitted with a whisk attachment, add the yogurt, half and half, vanilla extract, stevia extract and almond extract. Turn the stand mixer on low speed. Mix until smooth. In a small bowl, whisk together the matcha powder, xanthan gum and salt. With the stand mixer running, sprinkle in the dry ingredients. Increase the mixer speed to medium. Churn the ice cream batter according to your ice cream machine’s instructions. Freeze until it has the texture you prefer (for me, it takes around 3 hours). Serve, or you can scoop the ice cream into a tightly sealed container and store in the freezer. 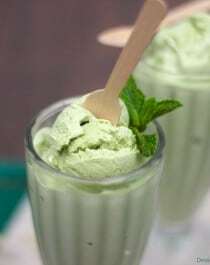 What a lovely deliciously looking matcha ice-cream! I love it too! I am so going to make it tomorrow,…ooh yes! I just discovered your website and love your recipes. I can’t wait to try a couple of them ( or maybe all of them), however, I would like to know why you don’t use peanut butter and opt for most other nut butters. I just wanted to say that your added comments to your recipes show your passion. I am truly enjoying reading your recipes. They all sound amazing. My first recipe will be your chubby hubby protein bars!!!! I actually use peanut butter a lot in my recipes, more than almond butter and other nut butters. Hi! Do you have to use xantham gum? If not, what substitutes can you use? I would love to translate your book to Spanish. I lecture a bit on these topics but there isn’t a lot out there in my native language… Thanks for a great recipe! I will buy your book next! Here’s the cool thing… half-and-half isn’t even bad for you! The big myth is that fat is bad, and cholesterol in food leads to cholesterol in your arteries… but this has been recently proven wrong which is awesome! When we eat healthy fats like olive oil, avacado oil, or (yes!) all-natural butter, it actually makes our cardiovascular systems healthier because the tissue surrounding our veins and arteries is mostly made of fat. Eating fat is essential to keep our systems healthy and functioning properly (but definitely make sure it’s healthy fat!). The cholesterol that clogs our arteries is not actually from the cholesterol in our food. I know, it sounds crazy, but this has been proven. When we eat refined sugars or grains, our liver actually produces a kind of cholesterol while processing it, and that’s the cholesterol that ends up in our heart. This means your cholesterol levels went down because you cut down on refined sugars/grains. Awesome job on that! There are tons of people that could benefit from it if they would commit themselves to eating better. But back to the fat… it’s actually dangerous to go low-fat, and has been recently proven to not help people lose weight at all. They did a study with one group eating low-fat, and another group eating a lot of fat, but they actually had to cut the experiment short. This was because too many of the low-fat participants were dying from heart attacks- no joke! They didn’t have any fat to support their cardiovascular systems. Not to be offensive at all, but I just wanted to share the good news that we need to be eating more fat, since the vast majority of the world isn’t aware of this yet. Cheers to good health! I’m sorry to be a negative Nancy here, but only to be shown an ingredients list but not given the instructions does NOT make me want to purchase your book. I would have been more likely to consider buying your product if you had shown me the full recipe. I totally understand that you may be frustrated that this recipe isn’t free, but in no way am I forcing you to do anything. If you don’t want my book, that’s totally up to you! My loyal readers have supported my decision to keep the recipes in the book — writing/photographing/publishing a book that took nearly a year to create, then publishing the recipes online for free, doesn’t make sense. I am a full time blogger (quit my real life job in January to pursue this dream), and my cookbooks are a main source of my income. I’m really not letting anyone down. This recipe might not be free but I have posted 550+ recipes on my blog over the course of 6.5 years that are free. You’re welcome to check those out. Hope you understand! This recipe calls for liquid stevia. Could I use a different granulated sweetener instead? Stevia doesn’t sit well with me and I much prefer swerve. I wouldn’t recommend completely omitting the stevia, but you can reduce it! I’d recommend halving 1 tsp of liquid stevia extract and 3/4-1 cup of confectioners swerve.